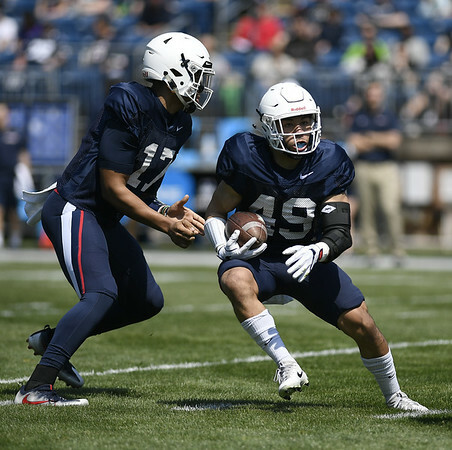 STORRS - UConn held its first workout in full pads Monday afternoon on the steamy grass practice fields on the west side of campus. And head coach Randy Edsall spent much of the workout adding some heat of his own with sharp words for players who weren’t performing up to par in his mind. A few players made their mark during the team periods of Monday’s workout. Safety Tyler Coyle, a sophomore from Windsor, had a pass-break-up and an interception on the first two plays of a 9-on-9 drill. At the end of the workout, the Huskies put each of their first three offenses and defenses in a two-minute drill. With the first-teamers, wide receiver Hergy Mayala caught a long touchdown pass on the final play to set off a brief celebration from the offense. But the “game-winning” score was wiped out by an offensive pass interference penalty as Mayala was called for a push-off, prompting the defense to cheer loudly. Redshirt freshman quarterback Marvin Washington led the second-team offense to a score in the two-minute drill, running the ball in on his own in the final seconds. During much of Monday’s practice, four true freshmen played with the first-team defense - cornerback Ryan Carroll and defensive linemen Travis Jones, Jonathan Pace and Lwal Uguak. Edsall downplayed some of the placements this early in the preseason. “Where guys are right now, don’t put too much credence in any of that stuff. It’s practice (number) five,” Edsall said. Jones, the 6-foot-4, 350-pound Wilbur Cross-New Haven graduate, is perhaps the most intriguing player the Huskies have welcomed to the team this season. Wide receiver T.J. Vernieri will no longer play because of lingering injuries. But the junior from Long Valley, New Jersey, isn’t leaving the program. Edsall said Monday he’s staying on as a student assistant coach. … Redshirt freshman defensive tackle Caleb Thomas (fever) was limited in Sunday’s practice and did not participate Monday. Posted in The Bristol Press, UConn on Tuesday, 7 August 2018 19:09. Updated: Tuesday, 7 August 2018 19:11.